What is Purdue Space Day? 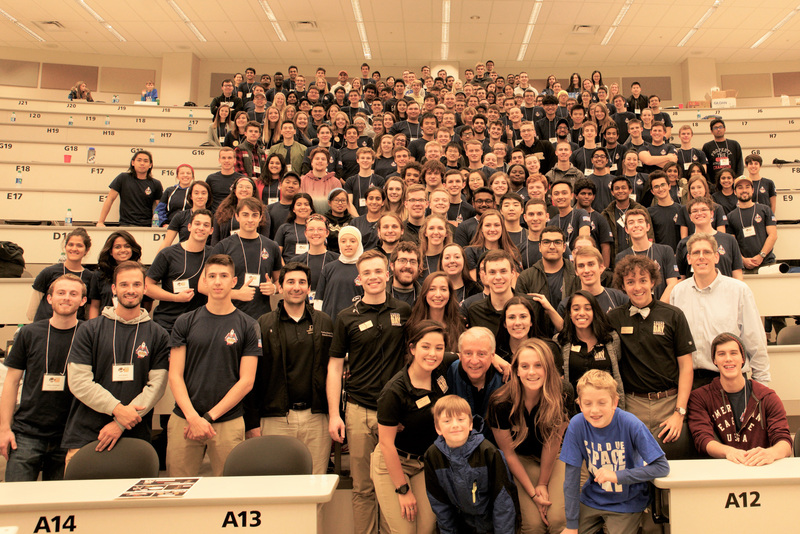 Organized by university students, Purdue Space Day (PSD) is an one day educational outreach program which provides school students in grades 3-8 the opportunity to learn about STEM by participating in three age-appropriate activities with a space theme. The participants are divided into three separate age ranges: Grades 3-4; Grades 5-6 and Grades 7-8. Since 1996, over 9300 grade school students have participated in PSD and over 3400 Purdue students have taken a lead in this exceptional program. Only because of the generosity and support from our partners and donors, PSD is able to provide an entire day's worth of space, science, and engineering centered activities for third through eighth graders at no cost to the participants. The Indiana Space Grant Consortium and the School of Aeronautics and Astronautics at Purdue both support the program and PSD is very grateful for this support. One highlight of the day is the attendance of a Purdue Alumnus Astronaut. The astronaut starts the day with a presentation and is on hand throughout the day interacting with the students and giving them first-hand information about their space flight experience. Past astronauts include John Blaha, Roy Bridges Jr., Mark Brown, John Casper, Andrew Feustel, Guy Gardner, Greg Harbaugh, Gary Payton, Mark Polansky, Loren Shriver, Scott Tingle, Janice Voss, Don Williams, David Wolf, Charlie Walker, Buzz Aldrin, and Jerry Ross . In addition to the day itself, the astronaut VIP also gives a one hour presentation on the evening before. This event is free and open to the public. It is always well attended, thus demonstrating the great interest in the nation's space program and astronauts.